As the weather gets colder and the days get shorter, my thoughts turn to comfort food. 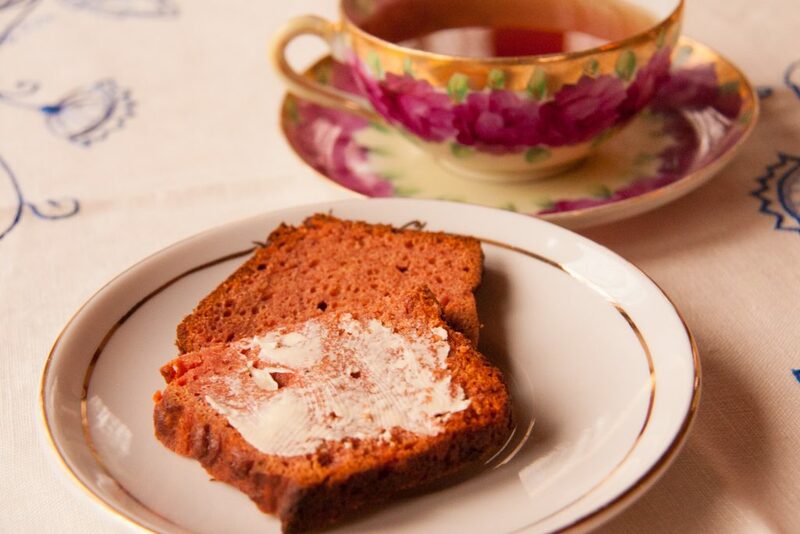 I look forward to a hot cup of tea at the end of a long day and when I have a piece of toasted silverberry quick bread to go with that tea, I don’t even mind that it’s dark at 4 pm. Well, I mind less. This silverberry quick bread has an exceptional, natural pink color. It’s lightly sweet, with a texture similar to that of banana bread. To take the sweetness up a notch, add a simple confectioner’s sugar glaze, or use the batter for cupcakes, and frost with vanilla icing. Silverberry (aka sweet autumn olive, aka Eleagnus umbellata) and spicebush berries (Lindera benzoin) are two fall fruits that combine wonderfully in this quick bread recipe. If you don’t have spicebush berries at hand, you can substitute allspice, or order Appalachian Allspice (another name for spicebush berries!) from Integration Acres. Run three cups of silverberries through a food mill, using the plate with the middle-sized holes. Depending on the plumpness of the fruit, this will yield between 1 and 1.5 cups of pulp. You’ll need a cup for this recipe. If you have any extra pulp, swirl it into yogurt or oatmeal, or use it as a topping for ice cream. Cream the butter and sugar, then add the egg and combine thoroughly. Set this aside. Combine the flour, baking powder, baking soda, salt, and ground spicebush berries, then blend them into the butter mixture. Add the silverberry pulp and vanilla to the other ingredients and mix thoroughly. The batter will be stiff. Spoon the batter into a greased, 9 x 5 loaf pan, and bake at 375 F for 50 minutes or until a toothpick comes out clean. Remove the baked cake from the pan as soon as it’s cool enough to handle, then let it cool on a rack. Silverberry quick bread is most delicious when lightly toasted and buttered: moist, spicy, and lightly sweet.